Say the wrong thing on Facebook or MySpace and you could lose your job – if you are a civilian. 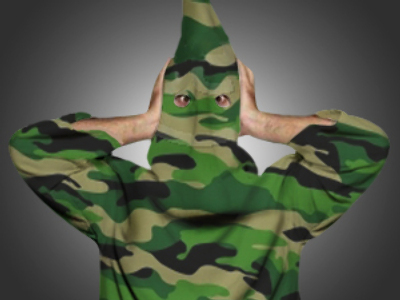 However, many white supremacists in the US military seem to have little fear regarding their online conduct. Hating other races may be a person’s prerogative if he is a civilian, but soldiers vow to serve and protect a nation, not just one segment of it. A soldier who is a white supremacist negates the possibility of allegiance to all, and their military training adds potential danger. During the recession of the 1990s, right-wing terrorist and extremist groups exploded. Factors driving the growth included economic difficulties, the outsourcing of jobs and proposed gun control. Then in 1995, Timothy McVeigh bombed a building in Oklahoma City. Now, the United States is in a worsening recession, with record-breaking home foreclosures, unemployment, limited credit – and has a black president who is proposing stricter gun controls. As a result, there appears to be another surge in extremism. Two white marines, Nicholas Daniel Hanke and Kody Brittingham, have already been arrested for threatening President Obama. A federal report on right-wing extremism notes that the government has detected “extremist chatter” on the internet, and high volume purchases and stockpiling of weapons and ammunition by right-wing extremists continue to be a primary concern. The internet could prove a window of opportunity for authorities if they are sincerely concerned that white extremist soldiers may take advantage of their training. The Southern Poverty Law Center (SPLC) accuses the military of permitting extremists to fulfill quotas for the ongoing wars in the Middle East. Former Undersecretary of Defense David Chu insists the military has a “zero tolerance” policy towards such behavior and rigorous screening. Earlier this month, the SPLC drafted a letter reiterating the need for an investigation into the threat posed by racial extremists in the military. The United States government has one of the best intelligence forces in the world and an obsession with terrorism, so it seems unlikely that real efforts to expose white extremists would end up fruitless. Many soldiers boldly express their views on the internet, give personal details such as their hometown and their branch of service. If that is not enough, they also post their pictures.